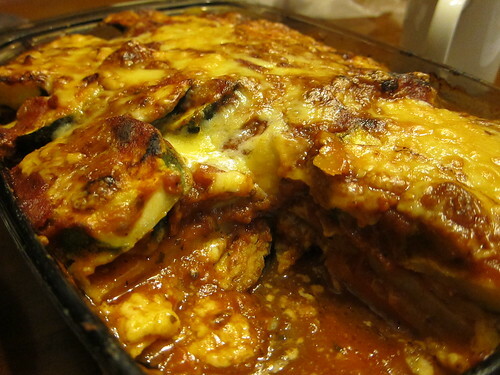 parmigiana | eat. drink. cook. travel. I love zucchini and had some hanging around in the fridge asking to be used differently from the usual pan searing and anchovy pasta combination. Coupled with some old and on the verge of moldering potato and carrot, I flipped through my recipe books and found Antonio Carluccio‘s recipe for parmagiana. Since I had a bit of time, this was it! You can use any sliceable vegetable for this, just make sure that they are well dried using paper towel before preparing them for the dish. For the cheese, I didn’t have any mozzarella, taleggio or the eponymous parmesan, so I settled with the cheddar I had. It’s a good melting cheese with very nice flavour, so it worked too. For the tomato sauce, I had a jar of pasta sauce from a while back that I again hadn’t got round to using. Be warned that the quality of the tomato sauce is very important. Some of them can be quite tart, so you’ll have to taste and moderate if necessary by perhaps adding a little sugar, or plain using a decent brand of sauce! I also had some aglio olio spice powder consisting of garlic, chilli and random herbs, so some of that went into the dish too. It all worked out to be a happy use of leftovers to make a yummy, satisfying dish. Slice the vegetables into long slices, as far lengthwise as you can. You’re looking for long, fairly thin slices of vegetables, about 5mm thickness for the root vegetables. For the zucchini, it can go a bit thicker depending on whether you like to bite into mushy zucchini goodness or prefer less of the mushy burst. Pack the slices into paper towels and leave to dry for about an hour or until you get back round to them. Meanwhile, get out a big casserole dish that looks like it could fit all the vegetable slices and more. Spoon out a thin layer of pasta sauce and coat the bottom of the dish. In a sturdy frying pan, saute the bacon dice in a little olive oil till brown. Sprinkle on top of the pasta sauce layer. Add some salt and pepper to the flour and mix well. Standby the beaten eggs. In the same frying pan, add plenty of olive oil till the bottom of the pan is coated. Get ready to fry over medium heat. Dredge each vegetable slice in the seasoned flour, then coat with egg. Let drip till most of the egg has dripped off, then fry, turning each piece as it turns golden brown. When golden brown on both sides, transfer each piece to the casserole dish. When a layer of vegetables has completely covered the pasta sauce, spoon over more sauce for the next layer and also sandwich in a few slices of cheese. Proceed till you’ve exhausted all the vegetables and cover with a final layer of pasta sauce, topping generously with cheese. Bake for 30 minutes, turning down the temperature slightly if the cheese starts to burn. After removing from the oven, let rest for a few minutes before slicing and serving.